Avira Antivirus Pro is great for detecting viruses and offers minimal impact on your PC's performance. Still, you don't get that much for $45 per year compared to the free version. Avira is a great choice for people who want a no-nonsense antivirus security suite with very few extras. The company certainly has a whole roster of services and features including a software updater, password manager, VPN, and system analyzer. 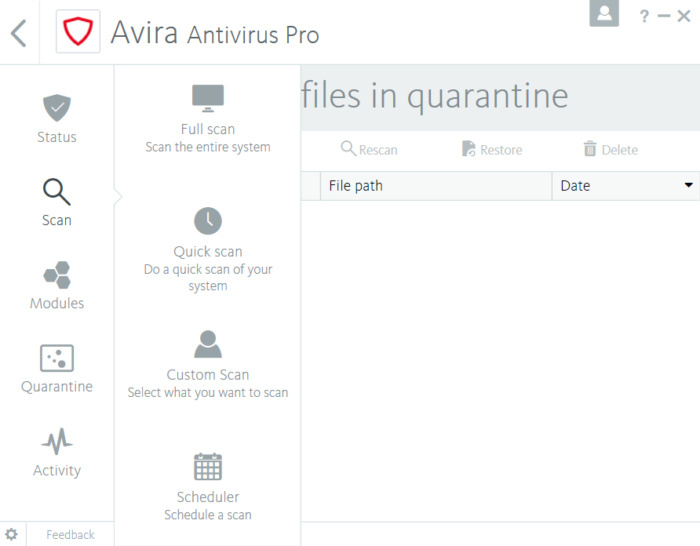 However, Avira focuses on its antivirus offerings first. Antivirus Pro—the subject of this review—is its main product for home users. Like its competitors, Avira has an “ultimate” package called Prime that offers all its products for a single price. It’s quite pricey, however, at $120 to $156 per year depending on how many devices you need to license. Antivirus Pro is far cheaper by comparison at just $45 per year for five devices, with support for Windows, Mac, and Android. At that price, Avira is quite basic antivirus protection, with no extras. 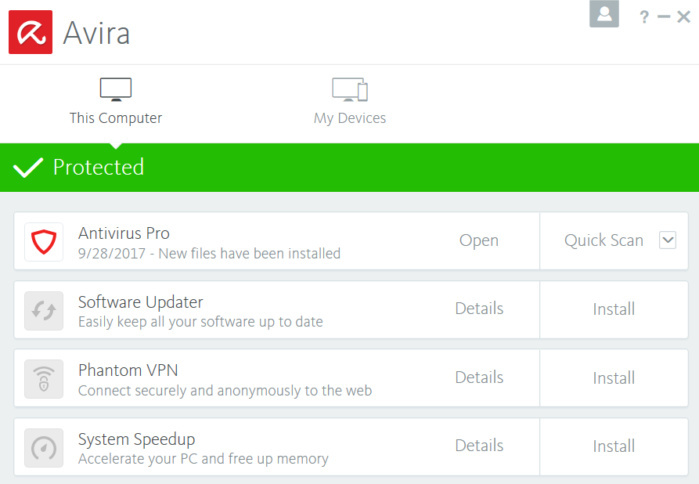 In fact, some users might wonder why they should pay for Avira Pro over the company’s free antivirus offering. When you first open Avira’s softwarea dashboard of sorts shows you what Avira components are installed on your PC, and which other offerings you can install, each with its own yearly subscription price. The only real choice you have is to open Antivirus Pro. Choose that and the next panel in the same window displays the antivirus interface. This is a rather small window with a left rail that offers five basic choices: Status, Scan, Modules, Quarantine, and Activity. The Status section is a dashboard showing your PC’s current security status. It tells you the status of the real-time protection, firewall, and web protection—each of these features is called a “module.” There’s also a button to run a quick scan. If you click on Scan a menu pops out from the left rail with options to do a full scan, quick scan, custom scan, or schedule a scan for a specific time. By default, Avira carries out a quick scan on a weekly basis. Modules also offers a pop-out menu similar to its neighbor. Here you can turn on or off real-time protection, the firewall, web protection, and mail protection. The last two sections are fairly self-explanatory. 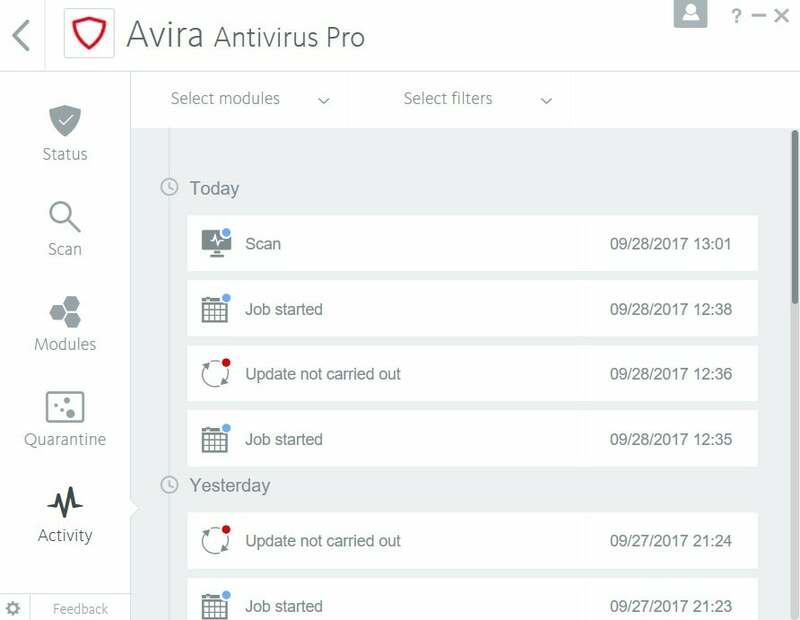 Quarantine shows all the various files that have been locked up for bad behavior, and Activity shows a history of actions carried out by the antivirus program. Avira’s interface is very simple to understand and it doesn’t over-complicate things by opening multiple windows—though a second one does open up for PC scans. The app is also quite straightforward and is simple enough for most users to navigate. The word “modules” as a menu option is likely to intimidate some users since it’s a little technical sounding, but the section doesn’t require much interaction anyway. 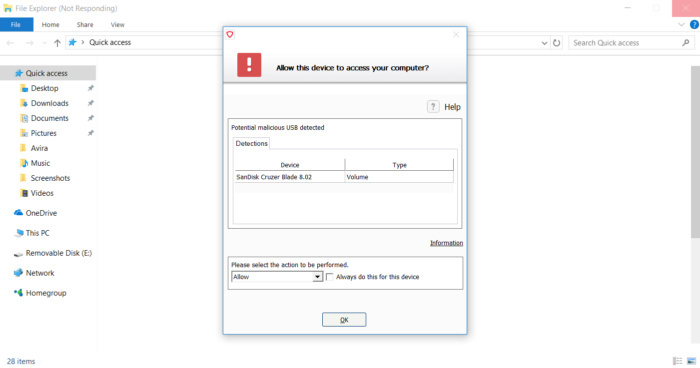 One interesting feature, which is probably more security theater than actual security, automatically blocks access to unknown USB keys until you explicitly permit it. The thing is, anyone standing in front of the PC can just tap OK, so it couldn’t stop someone from loading your PC with malware while you’re away. Nevertheless, it’s not a bad idea to be reminded that you should be wary of the USB keys you insert into your PC. The alert message could use a little work, however, since it considers any USB key you use as potentially malicious. That could cause some novice users to stop using USB drives altogether for fear they might be filled with malware. On the upside, you can mark a specific USB key as safe, meaning it will be let through every time, which also has its problems. A-V Comparatives found similar results with 100 percent in the real-world protection tests, and 99.9 percent in its malware test. It was also very good in the firm’s offline malware test detecting 98 percent of the nearly 38,000 samples. In our PCMark 8 benchmark test, our test PC scored the usual 2,538 without any anti-virus installed, and 2,533 with Avira running. The larger number is better, which means Avira caused a very minor drop in performance. In the Handbrake test, Avira caused a slowdown of about 45 seconds in the encoding performance of a 3.8GB HD video file. Usually, the test PC can complete that task with a fresh Windows 10 install in one hour, 15 minutes, and 30 seconds. With Avira running, that time went up to one hour, 16 minutes, and 13 seconds. Again, very minor impact for home users. 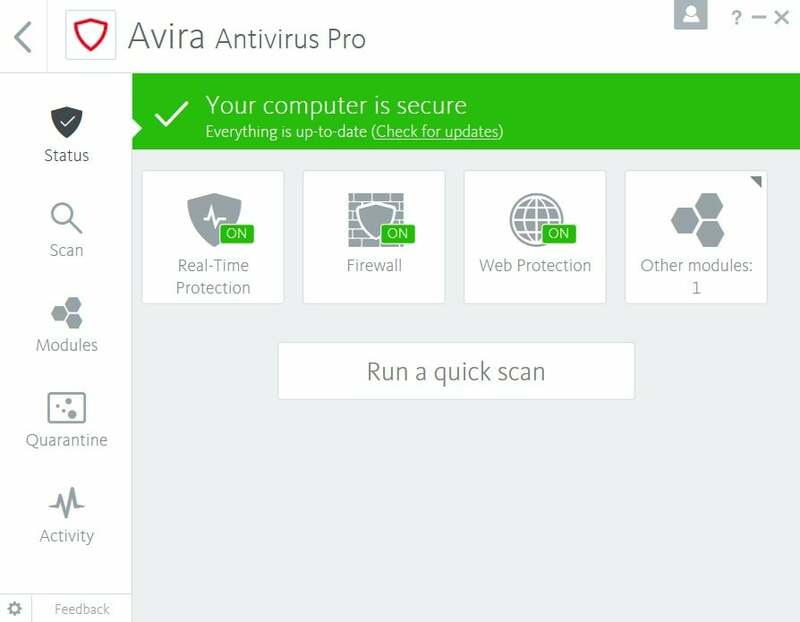 Avira offers great antivirus protection, but should you pay $45 for it? You certainly get value compared to similarly priced A-V suites. The trouble is that Avira’s free option isn’t that different from the paid version. The only thing you don’t get is the USB key warning (of arguable value), and web and mail protection. If you need mail protection and/or you like the idea of the USB key warning, then Avira is a good choice. Otherwise, I’d suggest you try out the free version and see if you’re missing anything.